Ever found the cost and the stress of developing a digital marketing strategy daunting? 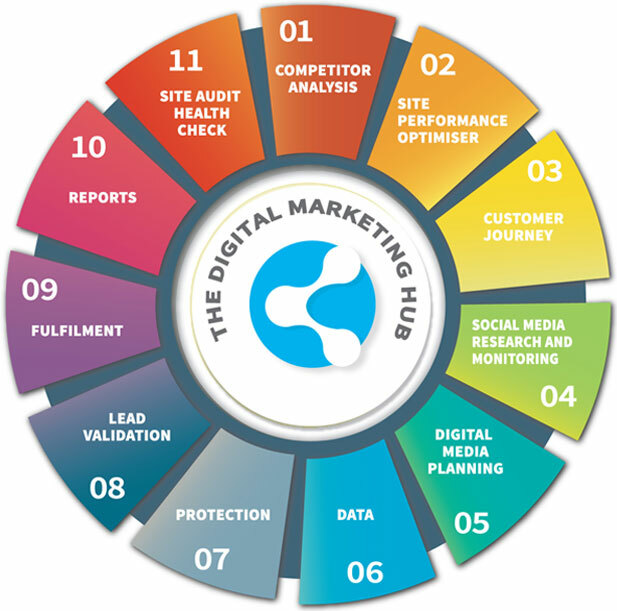 Our digital marketing hub is an innovative marketing service that shares the cost of agency expertise across a number of non-competing businesses. It allows you to have an integrated team of specialists at a fraction of the costs, driven by your own key account manager you will be one of a selected, non competing business that derives sector expertise including competitor insight, SEO, PPC, on and off page optimisation, user flow analysis, AB testing, click fraud suppression and much more all within one team. Industry leading world-class software provides on-going insight and monthly management reports that charts your progress so you stay in control! Would you like to know how your digital marketing is doing against your competitors? As part of our initiative to make the Midlands the most competitive digital economy we’re offering free digital marketing health checks. We will research your competitors, providing you with invaluable insight as to how your competitors have built and structured their websites, how they perform and what kinds of traffic they are receiving. This allows you to understand what strategy they are following and what opportunities exist for your own business’s digital marketing. We will roll up our sleeves and get started fixing problems, improving functionality and implementing the findings of our research. We will stick to your plan, in order of priority, so you get the results that you want. Each month we will confirm what has been done as well as provide recommendations on what needs to be done next against the diagnostic reports we provide. It’s important that the visitors to your website can find what they are looking for and interact with your business in the way that you intend. This may be an enquiry asking for more information or downloading some information. It’s important that the traffic to your site convert into desirable actions. To do this we need to optimise the website experience by examining the way people move through your site, the content they spend time looking at and where they get frustrated and leave your site. Then we begin the process of examining any issues that may occur, building alternative routes, pages and forms providing the very best user experience so that your hard won traffic converts to sales for your business. We will keep an eye on what people are saying, what they like and what they don’t. We will monitor the social channels to make sure that where people are discussing your company or your brand you have that knowledge and the timely insight in order to take action to protect your brand reputation and take advantage of any opportunities that exist off page. Would you like to know where your competitors are advertising, what they are saying, what are their latest offers and what kind of spend they may be allocating against this activity. Our digital media planning service examines just that. It takes a deep look at where your competitors are advertising, combing the site structure, landing pages and the advertising platforms so we can deduce the volume and price your competitors are spending. Bringing our knowledge and insight to your business we can provide the commercial experience that will give your business the advantage. We will continue to monitor competitor activity and spend so you always stay one step ahead of the competition. Let us help you get all your data in the right place and in the right format so you can put it to work, making your data a valuable asset to your business, ensuring that your data is protected and compliant with the new data protection laws that ensure your valuable data remains an asset to your business. Over 25% of online advertising is click fraud - Don’t lose out to malicious competitors clicking on your ads. We will check your visitors and make sure you’re not giving away valuable advertising spend – we provide diagnostic software that reduces malicious visitors and robots that are designed to erode your advertising spend. Your sales team are a valuable asset, let us take the strain, we will contact your digital leads and check the enquiry before passing them over to your team for conversion – we’ll use this information to continuously improve your digital marketing experience, feedback to each stage of the process to make sure it’s not just about numbers but your digital marketing spend provides value to the bottom-line of your business. We can provide initial fulfilment services - if it’s sending a brochure, a letter, email or price list we will action and make sure its instantaneous, ensure your potential customers receive a great first impression, we record all these actions in our regular management reports. You stay in control, we will produce detailed monthly management reports along with your dedicated account manager you can review your digital marketing performance and stay in control of your business without the headaches. We benchmark your competitors sites against your own, so we really understand what needs to be done to win within the online environment. Our analysis goes much deeper however, giving you information on how various search engines index, examine and rank your site structure, how it is linked and much more! This puts you in control, with your account manager you can determine what needs to be done, when and how – providing a monthly detailed plan of work – we will continue to benchmark your site against your competitors and provide monthly management reports so you can keep track upon progress.